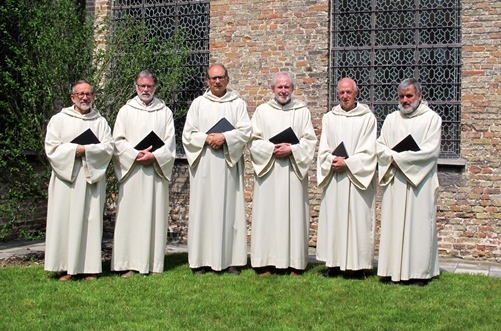 The Scola sings weekly the High Mass on Sunday at 10 AM in the serene monastic Church of the fathers Carmelites in Bruges, Ezelstraat 28A. We always consider to comply your requests for singing on funerals. For contact see the adress on the heading 'Contact' at the left foot of the homepage. The Scola Gregoriana Brugensis contributes to liturgical celebrations and concerts. The pioneering and the performing practice of the monks of Solemnes inspired the style of the Scola. Besides that the choir is open for new discoveries and a justifed approach of the Gregorian semiology.